Effect of Polysorbate 80 on degranulation of RBL-2H3 mast cells. Cells were treated with different concentrations of Polysorbate 80 for 60 mins. The degree of degranulation was determined by measurement of the released ß-hexosaminidase into the supernatant. Effect of Polysorbate 80 concentration on the cytotoxicity using SIRC Cells. Cells were treated with each Polysorbate 80 for 24 hrs. The number of viable cells was determined by the Neutral Red Uptake method. Basophilic leukocytes were immersed in 1% Polysorbate 80 solution for 30 min. The cells were immobilized in glutaraldehyde and observed by SEM. 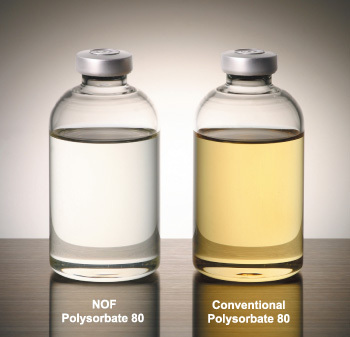 Effect of Polysorbate 80 concentration on the Hemolytic Ratio. Red blood cells from the guinea pig were treated with Polysorbate 80 for 60 mins. The hemolytic ratio was determined by the absorbance of the solution at 576 nm. Effect of Polysorbate 80 concentration on the Survival Rate of BALB/c mice. Polysorbate 80 was diluted with PBS and administered to mice by intravenous injection. This formaldehyde test was performed under air sealed conditions at 40˚C.